Shop Germ-X Hand Sanitizer Gel (30 oz. )30 oz. $479$4 and 79 cents$0.16 / oz. 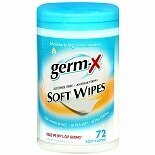 Shop Germ-X Antibacterial Soft Wipes (72 ea. )72 ea. $249$2 and 49 cents$0.31 / oz.